Susroot is a delicacy of Dogra Community from Kashmir. 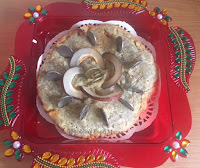 It is a rich sweet flatbread loaded with crushed dry fruits and flavoured with cardamom, fennel seed powders. 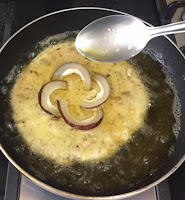 It is fried in pure Desi ghee. This bread is specially made as a ritual when the bride goes to her in-law's place. After the bread is fried some coins are inserted in it as a symbol of prosperity. 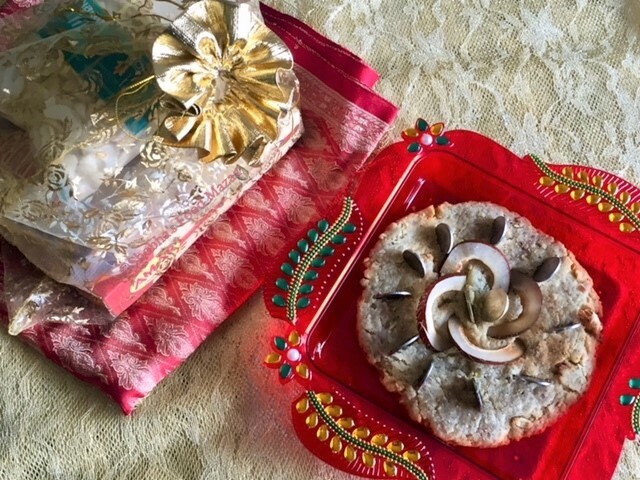 Susroot is sent along with many other goodies in the "Thaal". Knead the dough adding water as needed. 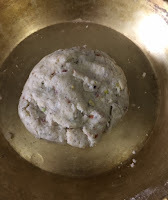 Roll it out into a thick roti. Garnish it with the coconut slices as shown in the picture. (Fix the edges well into the roti so that they don't fall off. 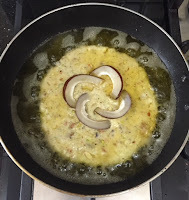 Heat the ghee in a flat bottomed pan. Fry the Susroot on a low flame adjusting the heat to medium in between. Spoon the hot ghee from the pan on the roti while frying as we have to fry only one side. 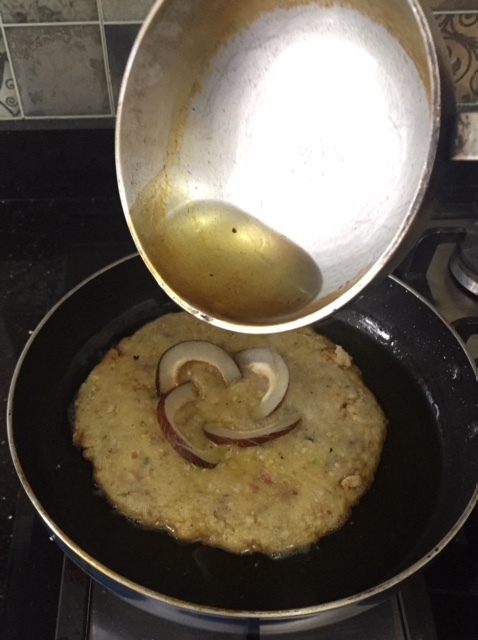 Towards the end heat some ghee separately in a small pan to a smoking point and pour over the roti while frying it so that the top portion also gets cooked. It should not be too crisp on to as we have to insert the coins. 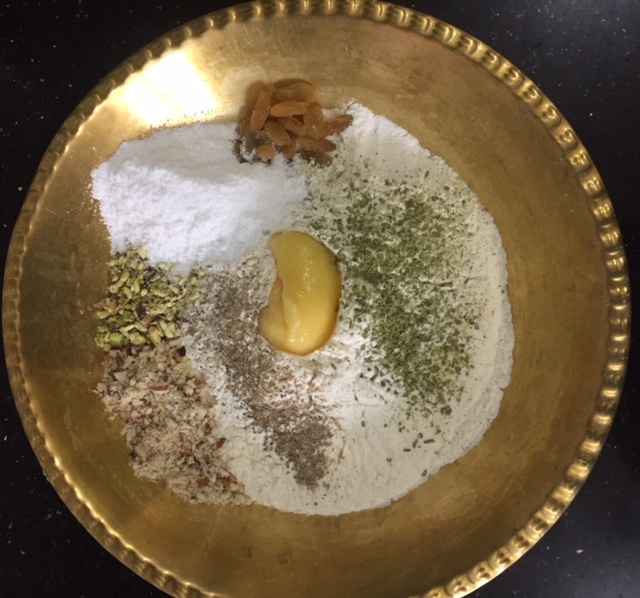 Remove it on a plate and insert the coins all around You can sprinkle a little cardamom powder on it for extra flavour. Wonderful bread recipe. I have heard of this but never attempted. I love the way you have done a step by step, so it is easy to follow. Thanks you so much for liking my post. 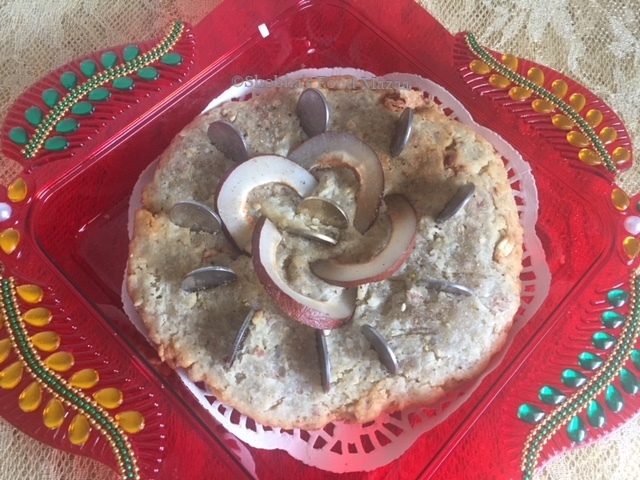 Wow this one is new to me never heard about it, thanks for the lovely recipe and the background of the dish was wondering why the coins are inserted in the roti after reading your post I was enlightened. Thanks dear .. glad you liked it. Wow this is so different, new to me. Would love to try this. Thanks Renu.You will fall in love with this melt in the mouth roti. A completely new recipe for me. Thanks for sharing. Never know about the ritual. Bread looks delicious and beautiful. Lovely share. Thanks Sujata.Good to learn about various rituals isn't it . This recipe is so interesting, especially the coin bit :) Is there any reason behind putting coins on the bread? Jagruti It is there in the post intro.. They do that for prosperity. wow lovely to see such a traditional recipe. Looks so tasteful and surely a treat for tastebuds. It definitely Is dear.. do try it sometime. Wow I love this coin adding. As for the recipe it is so delicious n yummy. This looks so delicious and is new to me. Thanks for introducing me to this. Lovely share. The bread sounds so good di. A new recipe to me. Wpulf love to give it a try. You must make it Poonam.. it is really very good. The sweet looks so delicious. Thanks for this lovelyt recipe. Quite an interesting recipe. Considering the delicious dry fruits, coconut, sugar and ghee. This flat bread must be a sweet bomb. That's a wonderful and sweet tradition for the bride. Nice to know about different community and their traditions. You said it Malini.. Sweet Bomb it is.. full of flavours and just melts in the mouth. Oh this is an interesting recipe. Frying the whole dough in Ghee is sinful and delicious. :) Perfect for the festive season. Yes Nisha.. it is sinful but the result you will see when you take a bite.. it is heavenly. 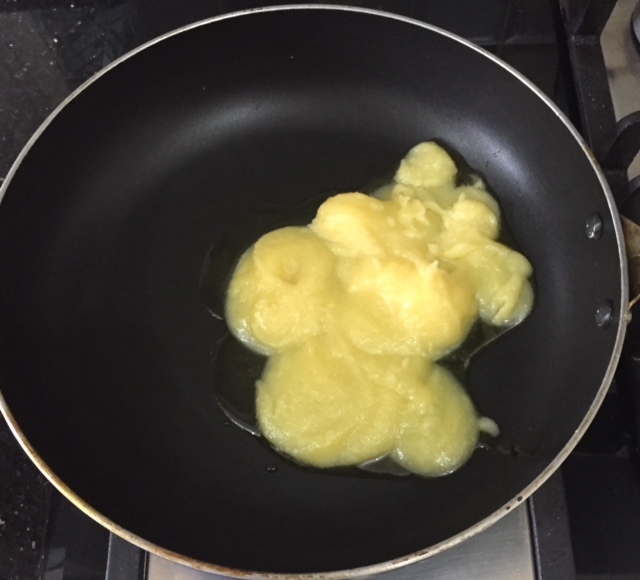 It is fried in ghee! And those nuts and spices must render an amazing flavor and aroma to the bread! Thanks for sharing such gems! Thanks for liking the bread Priya..
Wow Shobha, an amazing flatbread you've made. Just love the explanation about the roti and the tradition behind it. 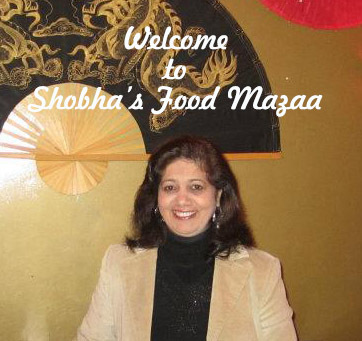 Wow Shobha. The susroot looks delicious and not too complicated to make. What a lovely tradition for making the kashmiri sweetbread. Thank you Mina. It really tasted Divine. Absolutely heavenly soulful & yummy. Thanks .. yes it tasted awesome. Such a rich and flavorful Kashmiri flatbread! I love Kashmiri flavors and the generous use of unique spices and dry fruits!! Awesome! !